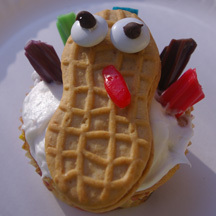 I’d signed up to bring cupcakes to a pre-Thanksgiving “harvest” event at my kid’s school, and I realized I wasn’t going to have to time for elaborate decorations. Thankfully, premade sugar toppers in pumpkin and owl shapes (I’m pretty sure these are by CakeMate) and leaf-shaped sprinkles came to the rescue. Also, the simple 1M swirl technique adds class to any cupcake. 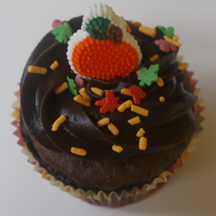 What You Need: 1 cupcake; chocolate frosting; 1M metal tip and pastry bag; premade pumpkin topper; leaf sprinkles. How to Make It: Fit 1M tip into pastry bag. Working from the outside of the cupcake inward, squeeze steadily to create a swirly top. Sprinkle with leave sprinkles. Add pumpkin to top. That’s it! Use Nutter Butter cookies to make tasty turkeys this Thanksgiving. What You Need: White frosting; 1 Nutter Butter cookie (you can use the whole thing or just half); 5 short lengths of colored Twizzlers licorice; small bit of red licorice or molded candy (such as Starburst or Laffy Taffy) for wattle; 2 white M&Ms; 2 mini chocolate chips. How to Make It: Frost cupcake. Use dab of icing to attach M&M eyes with chocolate chip eyeball to Nutter Butter. Cut or mold red wattle and stick it to the cookie. Set on cupcake. Position colorful licorice behind cookie for feathers. A chocolate Twizzler makes a great tree! Whip up a forest of these autumn trees quickly for Thanksgiving or any fall festivities. What You Need: 1 cupcake; yellow frosting; chocolate Twizzler licorice; candy-coated sunflower seeds; scissors. How to Make It: Frost cupcake. Cut length of Twizzler to slightly shorter than width of the cupcake. Use scissors to cut about four “branches” one-half to two-thirds of the way through the Twizzler. (It’s hollow.) 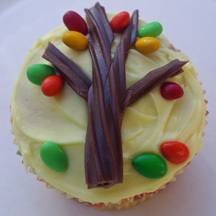 Spread branches apart and place on cupcake. Sprinkle and/or place sunflower seeds on tree and ground for leaves. 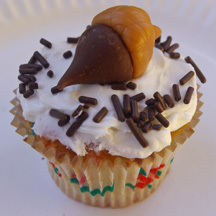 What You Need: 1 cupcake; white frosting; chocolate sprinkles; Hershey’s Kiss; 1 caramel; toothpick. How to Make It: Frost cupcake and add chocolate sprinkles around edge. Using clean or gloved hands, mold caramel into the shape of an acorn cap. Press onto wide end of Kiss. Use toothpick to press crosshatch pattern into caramel. 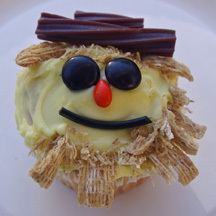 Shredded Wheat is the straw on these fun scarecrow cupcakes that are made using only candies and cereal — no fancy piping or icing in tubes! 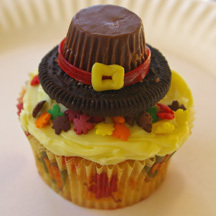 What You Need: 1 cupcake; yellow frosting; chocolate (or black) Twizzler; shredded wheat (I used spoon-size); 2 black or brown M&Ms; orange chocolate covered sunflower seed (or substitute mini M&M turned sideways); black shoelace licorice; scissors or knife. How to Make It: Frost cupcake. Break apart shredded wheat and sprinkle or place at top and bottom for straw. Cut Twizzler into one length almost as wide as the cupcake and another length slightly shorter. Assemble as shown for hat. Place candy eyes, nose and mouth. Add the look of “Indian” corn to your harvest table with these easy Thanksgiving cupcakes that look like an ear of dried corn. 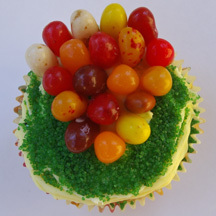 What You Need: 1 cupcake; yellow frosting; green sprinkles; assorted fall color Jelly Belly jelly beans; paper and scissors to make a template. How to Make It: Frost cupcake. Cut a wedge shape from scrap paper to use as a template or “mask” and set it on the cupcake as you sprinkle the rest of the cupcake, forming a corn husk shape. Then remove paper and arrange jelly beans, either skinny side up (like this) or the other way. Looking for an easy way to construct pilgrim hats this Thanksgiving? Just arrange candies and a cookie! What You Need: 1 cupcake; yellow frosting; leaf-shaped sprinkles (optional); Oreo or other sandwich cookie; mini Reese’s peanut butter cup; red fruit roll; yellow (lemon) Starburst candy; knife. How to Make It: Frost cupcake. Sprinkle with leaf sprinkles. Using dab of icing, secure wider side of unwrapped Reese’s cup to center of Oreo half. With knife, cut thin (appox. 1/4″) strip of fruit roll and wrap around base of Reese’s cup. Using clean hands, mold bit of Starburst into a “snake” shape, flatten, and bend into a square for buckle. (Pinch edges to make it more square.